After way too many months to count, the Pink Ice lap quilt top is finished. I’m thrilled with how it turned out. Every stitch was done by hand, including joining the blocks into rows and the rows into the top. There’s a bit of a story to Pink Ice. I fell in love with the Snow Crystal block when I first saw it in this little book called Quilts, A Beautiful History. When the free downloadable collection of Inklingo shapes came out that included all the shapes I needed to make Pink Ice I immediately knew I’d make this quilt. Luckily, another Inklingoist also wanted to make the blocks using pinks so we swapped a number of printed diamonds. I’ve had the top together for a while and kept wondering about adding a border. I tried a few ideas and nothing seemed right. I often find that borders don’t appeal to me for the quilts I’ve made, although there are definitely exceptions to that. When I look at pictures of antique quilts, I’m always struck by how many of them don’t have borders. 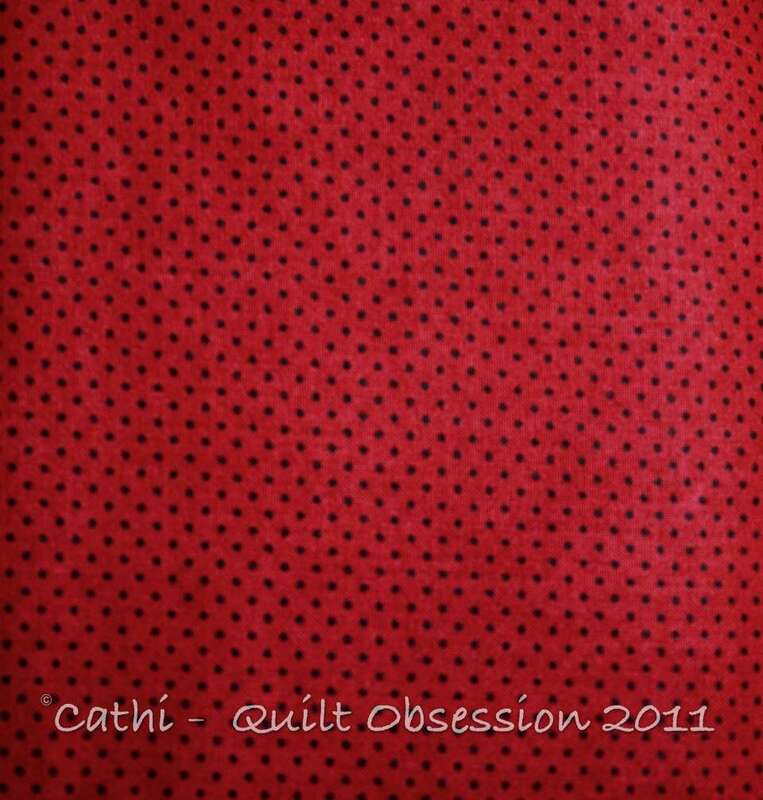 Once I decided that no border was necessary I chose this dark pink with black dots fabric for the binding, as I think it will frame the quilt quite nicely. A new pattern for Pink Ice has been added to my website here. It includes the printing and cutting instructions, as well as stitching and printing tips, for a scrappy two-colour quilt, a classic two-fabric quilt and a three-colour variation. Mr. Q.O. and I are very grateful for all the wonderful heart-felt comments we’ve received about Smudge since Monday’s post. It’s still a bit too emotional an issue for me to say much about it, but oh, how we miss him and find ourselves still looking for him. His drinking habits, his tiny little meow, that glorious tail and that adorable face are permanently etched in our minds and in our hearts. We feel Smudge knew it was time and had passed the baton to Baxter. He passed peacefully on my lap. For that I will be forever grateful. Baxter’s personality and character is becoming more and more obvious. He likes watching baseball, loves to play with kitty toys and is very determined to get his way when he wants something. That said, he is the sweetest of cats with a non-stop purr. He has proven that he’s definitely going to be a quilter’s cat. I was stitching last night with him on my lap and he was having a great time batting at the fabric. Right now we think he may be teething as any paper he can find gets a few bite marks. We’re quickly learning that books and magazines have to be out of kitty reach. He’s also not the least bit camera-shy. We’re really intrigued by his eyes, wondering whether they will be gold or green. I think they’re going to be gold, Mr. Q.O. says green. Whatever colour they end up, he is a wonderfully sweet kitty and we are enormously thankful that he has come to live with us. Ohmygosh! That’s gorgeous, Cathi! Only you can make me like something that’s pink, LOL. I have an idea for the border. How about a lighter pink for the top and left and a darker one for the right and bottom. The Pink Ice quilt is so beautiful! Our furry friends become so much a part of our lives that it’s difficult we mostly outlive them. We will miss Smudge’s pictures and he must have known that Baxter would sheer you up. He must have felt so at ease to pass on your lap. Love your Pink Ice, how pretty. Was devastated to read of Smudge. I know only too well the loss of a loved pet. Hugs and thanks for your kind words for me, over my recent losses. 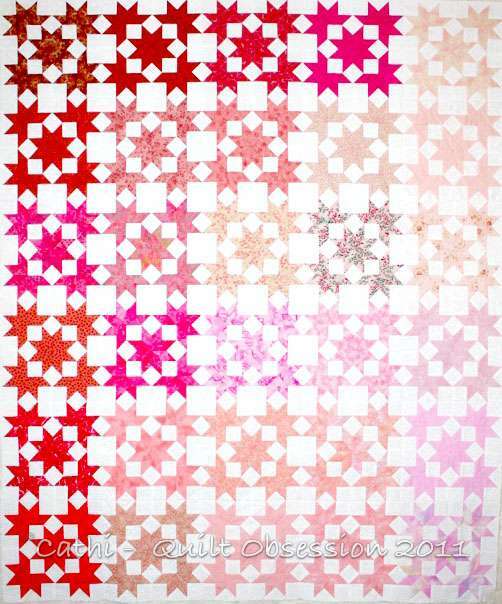 The pink ice quilt looks lovely and the binding will suit it very well. Baxter has big paws to fill and I am sure he is trying, and will be very happy with you and Mr QO. A new pattern, too? I have to go check that out! And a facelift on your blog that’s lookin’ great. Dig it!!! Congrats on the new pattern. Yippie Yahooie. Little Baxter will help you decide on the borders of that quilt, just direct him to the fabric and he will curl up on the ones you want to use! Good luck with the teething! My daughter’s 3 kittens, now 1 year old are still caught chewing on paper! They must like the feel of the crunch, or they know it gets some more attention to them! Oh, as beautiful as your quilt is, I fear it is Baxter who steals the show!! The picture of his sweet little face took my breath away…he is absolutely adorable! I am so glad he is a part of your family, knowing he will be loved and have the best of care…and we will all be able to watch him grow and hear of his antics. I like the changes in your blog. Look how big Baxter’s feet are, it’s amazing he doesn’t trip over them all the time LOL. Pink Ice is just wonderful! Especially for a pink lover like me! I feel you heart ache at the loss of two wonderful companions, but glory that Baxter has found a new home with you! Big hugs to the O’s….keep stitching…watching your progress is so much fun! Congratulations, Cathi! I love your second pattern. You should be very proud of your accomplishment. I know it will do well. And Baxter is a sweetie. Great photo. Wonderful job on Pink Ice! There’s nothing like an all hand-pieced quilt, and this one is so beautiful with a particularly lovely set. I agree with you on the border — I often don’t add them, and I’ve never regretted it. 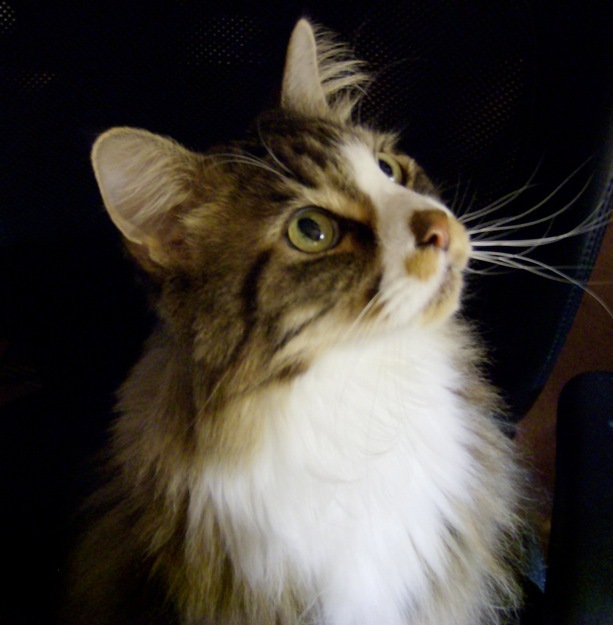 I am looking forward to seeing Baxter grow up on your blog — he is one gorgeous cat! Oh my goodness, Pink Ice is amazingly fabulously wonderful!! I can’t wait for my birthday printer to arrive so I can get started ;o) Baxter is so cute – I don’t know what I find most appealing…his ears, his eyes or those paws! My sympathy to you in the loss of your dear Smudge, but you certainly have many happy memories. It seems Baxter has found his way into your heart and there will be many more happy memories with him. I love your Pink Ice and agree that it doesn’t need any border, it is beautiful just as it is. 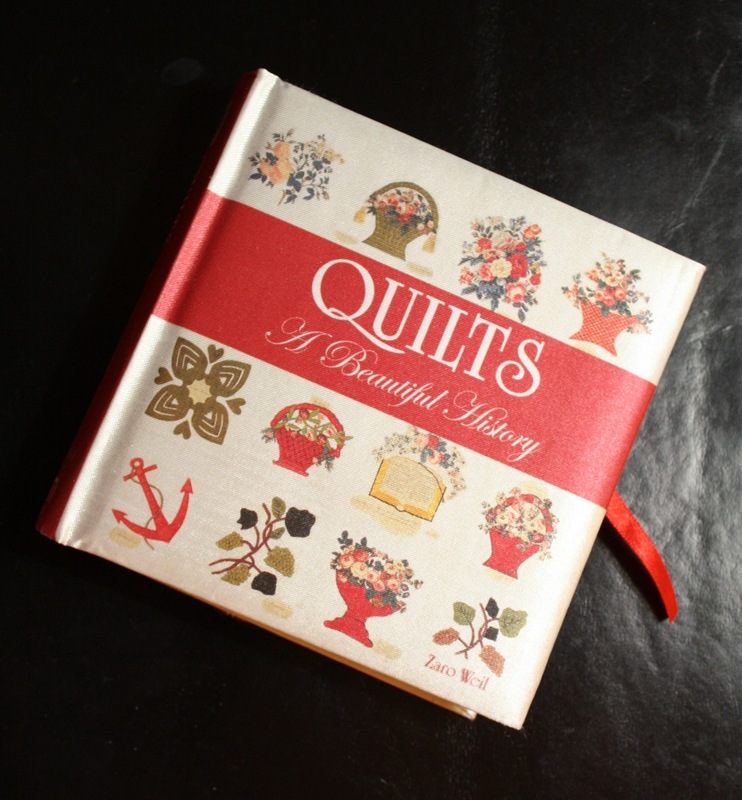 I’ve ordered this book, as well as the author’s other, America’s Beautiful Quilts. One can never have enough quilt books, and I can’t wait to see them both! Thank you for telling us about this author. Oh, I LOVE your quilt! It’s beautiful! Congratulations on your second pattern! So happy for you! Give our best to Mr. Q.O. and Master Baxter. 🙂 Keeping you in our thoughts. Oh, LOVE the bindiing fabric also! Beautiful quilt. And all by hand, a bonus. Baxter has some big shoes to fill. Glad he has warmed your heart. Glad you are posting again. What a gorgeous quilt, it reminds me of coconut ice – do you have that in Canada? Like you I have noticed how many older quilts didn’t have borders, perhaps it was considered a frivolous use of fabric! Hugs to Baxter, he looks as though he will be a busy little feller….he’s really lovely. Tis truly gorgeous and I am glad one of us finished!! And the little guy is soooooo cute. There was a stray kitty by my garbage cans as I came home last night -a little tiger striped guy and it took all I could muster to resist him.. But I cannot have three cats! I am already eccentric without the cat lady moniker to contend with.. But you never know, I could change my mind..
Just getting the chance to reply to this post. Crazy few weeks for me…anyway I am intrigued at the way you arranged your top so far. I fell in love with Ice Crystals when I found it in Sharon Craig’s Lemoyne Stars book a few years ago…OK, quite a few years ago! LOL It’s one on the list right now! I also have noticed that many vintage quilts don’t have a border…I think partly that they weren’t covering beds that are a large as ours are today along with other reasons.